In today’s ever-evolving technical landscape, it’s no surprise that the millennium generation’s digitally tapped-in teens turn to searching online for health information. A recent poll conducted by GfK for Northwestern University showed 25% of U.S. teens stating they obtained “a lot” of health-related information online. Although this trailed human sources, like parents (55%), school health classes (32%) and medical professionals (29%), online searches trumped all other media types, including books, TV news, radio, newspapers and magazine articles. When it comes to tech-savvy teens and search, Google leads the pack with 58% of respondents citing the search engine as their main source of acquiring information. An additional 14% cited Yahoo or Bing as their go-to digital health source. Social sharing networks and re-marketing ads barely registered in the poll. When choosing which sites to visit, search engine optimization does play a role in the findings, with teens citing they clicked on the first site that populated in the results and only chose another when they weren’t fully satisfied with the information they found. 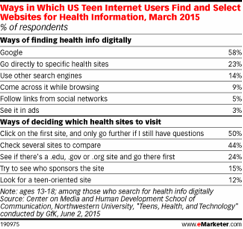 Health-related sites that featured information specifically geared towards teens saw 12% of respondents preferring to access the content. Respondents were also less likely to use site domains or click on sponsored ads. eMarketer estimates that 24.2 million U.S. consumers ages 12 to 17 will access the Internet from any location via any device at least once per month this year, representing 97% of the population in that group and nearly 10% of all Internet users. 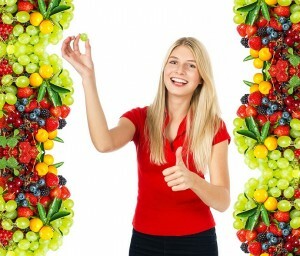 For health companies targeting this group, strong search engine optimization is critical. However, Northwestern also noted that schools should teach best practices about running online health searches in order for teens to locate the best sources of information.